Aldi had such great produce prices this week--99 cent pineapples, strawberries, grapes and melon. We decided to garnish the cold salad plates with fresh fruit skewers. 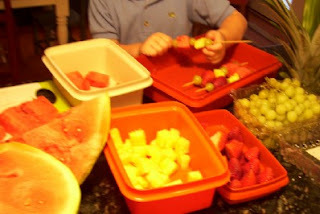 I separated the sliced fruit into Tupperware bins; my 5-year-old assembled the skewers. He loved designing the pattern--and of course, working with pointy sticks. 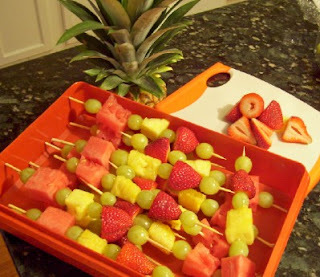 Fruit on a stick is easier to handle than separate dishes of fruit salad, especially at a buffet luncheon. Tip: repeat your cheapest fruits (grapes) between single chunks of more expensive items. Well, imitation is the sincerest form of flattery, right? I needed a snack to take for a bunch of tweens at the pool today. So, I nipped out for some skewers, and I have a container of pineapple-grape-watermelon skewers in the fridge waiting for the kids.